Hello, my dear readers and food lovers! You may tell from the picture and the name that this is a not a recipe for Ancient China food. However, it has something unique to do with authentic Chinese food, which is the Chinese stir-fry cooking method. If you love Ancient China food, such as Moo Goo Gai Pan, you should definitely try this recipe just to have a different flavor twist. This is a guest post from Ka Pang Kwan, a restaurateur in Malaysia. Thanks for sharing! Chinese Malaysian food is a unique cuisine in Malaysia. If you know how this multi-ethnic nation came into existence after world war two, you will understand how the diverse selection of cuisine known worldwide as ‘Malaysian Food’ came into existence. 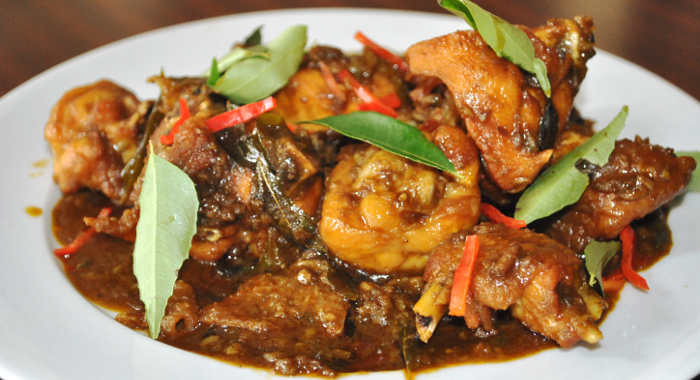 Malaysian cuisine is not derived from one, but the culinary uniqueness of Malay, Chinese, Indian, Eurasian, Nyonya cuisines and the cuisine of the indigenous peoples of Malaysia. The Chinese first resided in Malacca on the west coast of the Malayan Peninsula during the Ming dynasty in the 15th century. Many of the Chinese who follow the expedition of Admiral Cheng Ho decided to stay in this country. A number of these early residents intermarried with the locals and absorbed the local culture, forming a special clan known as Peranakan. Chinese Malaysian food has since evolved and become one of the major culinary heritage of Malaysia. One of the major impacts of Chinese Malaysian food is how it helps to shape the Malaysian street food culture. Street food – fondly termed as hawker food in Malaysia – †is essentially food you obtain from roadside and backyard stalls, which are usually relatively quite affordable. Some of the most famous street food is Char Keow Teow (fried flat rice noodle with cockles and Chinese sausages), Keow Teow Th’ng (soup noodles with fish ball), Hokkien mee (spicy curry noodles) and Laksa (noodles in thick fish broth). These dishes have become the everyday staples for many local people for breakfast as well as for lunch. Chinese Malaysian food also makes a huge impact on the menus of the more exclusive fine dining restaurants. Since the Chinese are known to consume anything under the sun, the chefs will prepare food with just about any ingredients with any possible methods. While Chinese dishes are usually moderate in flavor, the Malaysian Chinese have innovated and invented recipes with a touch of †western and Indian flavors, creating a sumptuous hot and spicy Chinese cuisine that is that is truly unique and only available in Malaysia. For instance, there are numerous variants on a single, simple dish such as noodles. Fry them on intense heat over a heated wok with a bit of soy sauce and sesame oil and yes, it will become ëChar Keow Teowí; give it a bit of gravy, a few potato leaves and anchovies, and it will be ëPan Meeí; prepare the noodles with prawn heads and chicken stock and serve with prawns, fish cakes and water spinach and it is ëHokkien Meeí. The list continues. Pork and chicken are very common, but sometimes exotic meat such as frog, snail, venison, shark fin and the infrequent lizard are utilized. Chinese Malaysian food is one of the most diverse in Malaysia and available everywhere – from hawker food courts through Chinese coffee shops and fine dining restaurants to the simple Chinese family. Kam Heong chicken is a Chinese Malaysian cuisine showcase of the unique amalgamation of Chinese stir-fry and Malay cooking ingredients. Dry shrimp is a traditional ingredient†for the Chinese, whilst curry leaves and bird’s eye chili are primarily used by the Malays. The recipe is divided into two sections. †The first section helps you to prepare the sauce. †You can keep the excess sauce in the freezer for up to two months. The second part helps you to prepare Kam Heong chicken by using the sauce. †Kam Heong sauce is not only great for chicken, but is also suitable for prawns, crabs or the special Kam Heong flavor chow mein. 1. Heat up the oil. Saute the dry prawns, chopped garlic and chopped shallot until fragrant. 2. Add curry leaves, bird’s eye chilli, seasoning and stir-fry until aromatic. 3. Remove from heat. It is now ready for use. 1. Combine the chicken with the marinade and leave aside for 30 minutes. 2. Deep fry the chicken in hot oil until it turns golden brown. 3. Heat up one tbsp of oil and saute the Kam Heong sauce until fragrant. 4. Add the deep-fried chicken and water. Cook until the gravy thickens. 1. Bird’s eye chilli is widely available in South East Asia. If you experience difficulty getting it, replace with other chilli but be sure to make it hot to your taste. Bird’s eye chilli is very spicy can and only be used in a small amount. 2. Soak and rinse the dry shrimps thoroughly with water. KP Kwan is a pharmacist turned restaurateur who lives in Kuala Lumpur Malaysia. He has a keen interest in Asian food. †You can follow him at tasteasianfood.com.